Hopefully at this point, as a business owner, you understand the importance and the power of social media marketing. It doesn’t matter what industry you're in. It doesn't matter if you are B2B or direct to consumer. Social media marketing is one of the most cost effective ways to build brand awareness in today’s business world. Consumer Behavior has changed quite a bit since the early 2000’s. Television and radio are no longer the most effective channels of advertising. Those two mediums are passive in nature, as people have no control over what commercials they consume via television and radio. Unlike social media which is very targeted in nature and users are actively deciding to follow you. It can be tough to know where to start if you have yet to make the transition, as there are so many different social media platforms to choose from these days. The first step is identifying your target demographic. Once you know more about your ideal client or customer, figure out which social media platform they are most likely to be utilizing. Facebook is a must for every business in my opinion. Consider the fact that 79% of all adults worldwide you Facebook. Creating a basic fan profile page is generally a good idea, even if you aren’t going to use it for lead generation. From a reputation management standpoint, if you don’t create the page for your business, someone else could. 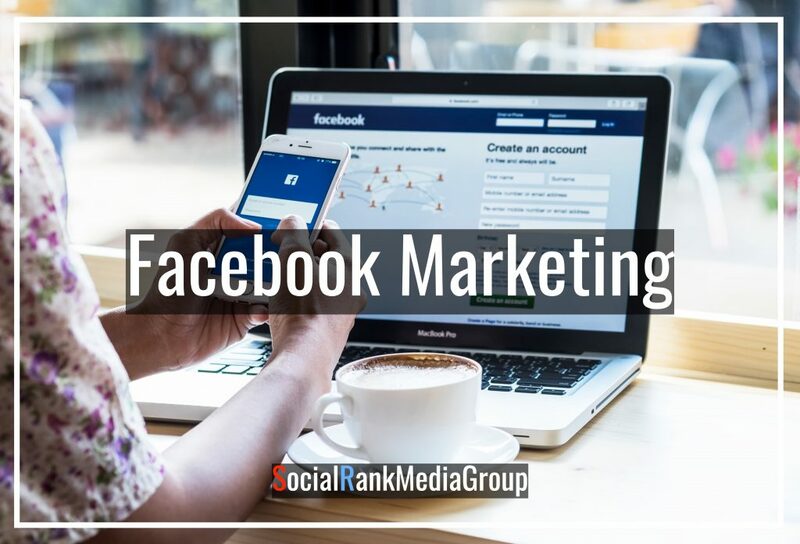 From a social media marketing standpoint, Facebook is the best place to start for any business. Facebook has 1.18 billion daily active users that spend an average of 50 minutes on the platform. It doesn’t matter how amazing your product or service is if nobody knows about it. The first step is creating a Facebook “Fan Page.” Over 30 million businesses now utilize Facebook fan pages. Whether you are B2B or a straight to consumer business, Facebook is great way to create brand awareness. It’s also a great place to advertise as you can build target audiences. If you are an E commerce business or any kind of a media company, then you should be going all in on Facebook. Believe it or not people do a lot of shopping through their Facebook news feed these days. It’s also a lot of people’s primary way of consuming news of any kind as well. Facebook is the most versatile social media platform out there. When they identify a cool new feature from one of their competitors, they always seem to find a way of integrating it into their platform. You can roll out simple status updates like twitter. 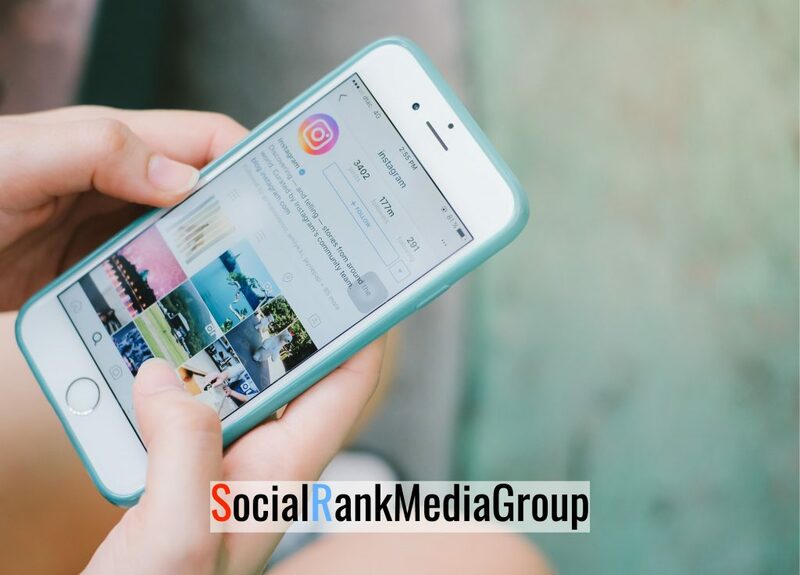 They acquired Instagram, so if you take the time to link your instagram to your Facebook, you can upload something to Instagram and easily have it feed to your Facebook profile as well. You can post and share videos like Youtube. You can create stories and implement filters like Snapchat. Or even stream live content like Periscope. So if you are thinking of dipping your toe into the pool of possibilities that is social media marketing, definitely start with Facebook. Instagram is one of the more visual social media platforms as it’s based around images and short videos. As of the end of 2017, Instagram has over 800 million users. If your business is visual in nature, you should absolutely be utilizing Instagram in your social media marketing efforts. For the first 6 years, Instagram utilized a simple reverse chronological feed. Regardless of quality or engagement, you would see the most recent post first. Then in March of 2016, the sky fell and Instagram announced that they would be incorporating the use of an algorithm. There are two pillars to Instagram growth now that they have switched to an algorithm. The first pillar is engagement. Engage with your followers that are taking the time to like and comment on your posts. Respond to every comment you get. Go out of your way to return the favor by liking and commenting on their posts as well. Doing so ensures that your posts will show up higher on their feed when they first open the app. Obviously this can be time consuming, but it's absolutely essential to organic growth when you're first starting out. This is one of the most effective ways of creating a loyal following on Instagram. The second pillar to growing your followers organically is the use of hashtags. Effectively using hashtags allows you to reach new audiences within your niche. Getting into the coveted “Top 9” for any relevant hashtag will have a significant impact on your growth. The maximum number of hashtags is 30, so the more the better. Make sure all of the hashtags you implemented are relevant to the post itself or at the very least your business. Research trending hastags within your niche before you post and utilize a mix of highly used hashtags and others that are less common. If you have a specific location or service area, make sure you also mix in some location based hashtags as well. Twitter is a network for conversation, not a mass messaging channel. Twitter is multifaceted from a social media marketing standpoint. Twitter is also becoming the top option for social customer service. Close to 35% of consumers prefer to customer service via social media now. Twitter is utilized by younger demographics more than older. 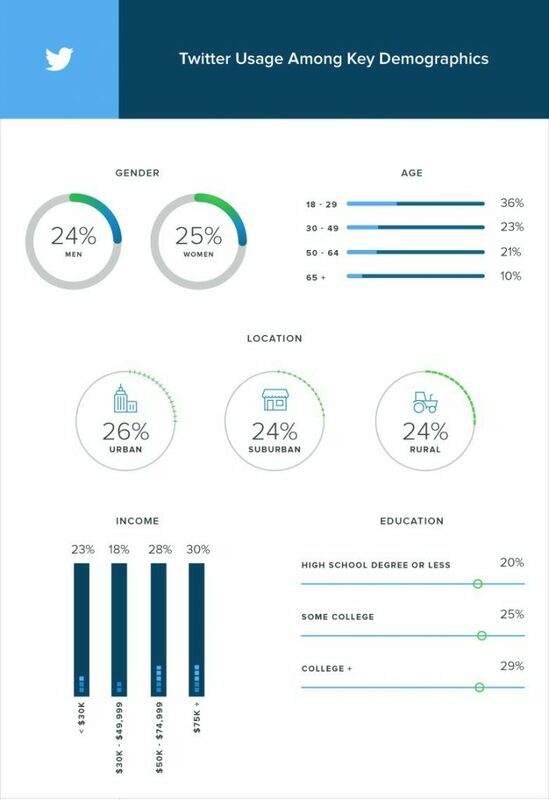 36% of 18-29 year olds use Twitter and between 21% and 23% of 30-64 year olds use Twitter. The numbers fall off a cliff from there. So if your target demographic is older, Twitter may not be the best option. Don’t make the mistake of using it as a bullhorn, as you will most like get limited engagement. Even if you already have a massive following, it doesn’t ensure that they are going to see every tweet you put out there. Even the top brands and celebrities aren’t seeing the level of engagement they once did. Start thinking of Twitter more of as a direct line of communication, like a telephone. The Twitter algorithm attempts to show it’s user the Tweets they’re more likely care about. So it rewards the brands and users that share content their audience actually wants to see. If your followers are engaging with your tweets, then your future tweets are more likely to show up in their feed when they first login. One way to ensure this is by creating one on one conversation’s with your followers. Twitter can also be used for lead generation. Put yourself in the shoes of your potential client and search for keywords related to your business or a problem your business tries to solve. Send direct replies to individuals who may be interested in your service or product. LinkedIn is a must if your business is B2B. If you are B2B and you have yet to integrate LinkedIn into your social media marketing arsenal, now is the time. 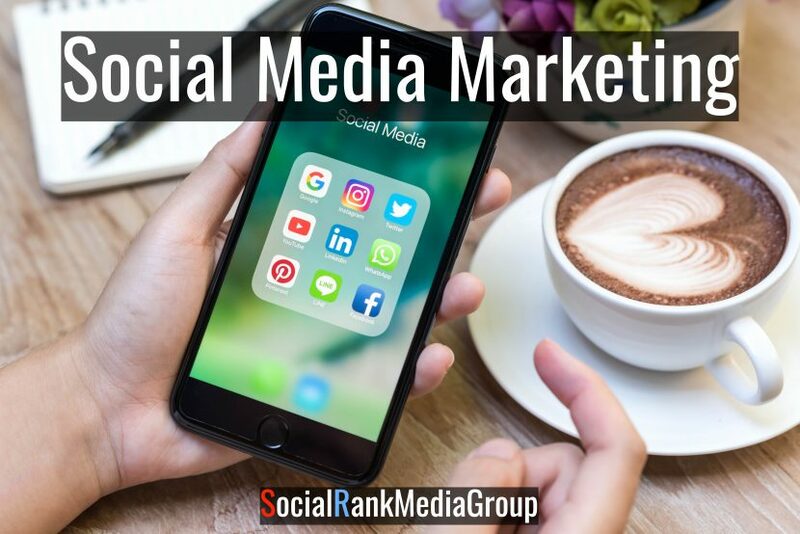 Known as the social media network for professionals, there are currently over 467 Million registered users and 133 million of those reside in the US. Even if you aren’t going to utilize it as a lead generation tool, I still believe it is worth setting up a basic company page as it can improve the legitimacy of your business. 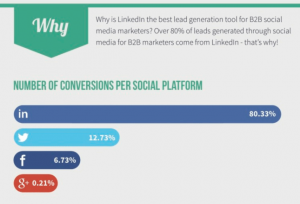 When it comes to generating B2B leads, LinkedIn is by far and away number 1. LinkedIn comprises more than 80% of business’s social media leads. All the other platforms put together only amount to just over 19% of lead generation. The first step in utilizing LinkedIn for lead generation is to create a company page for your business. Generate a captivating image in the header that draws people in. Create a clear and compelling pitch in your company description. The first few lines are the most important. To get past this part of your LinkedIn page, they must click the “see more” button. So you have to grab their attention right out of the gate to compel them to continue reading or they won’t read the rest. Identify your target audience, define your value proposition and define your product or service as efficiently as you can in those first few sentences. Once they click the see more button, the link to your company website appears. It’s also important to utilize the recent updates section for those prospects that scroll past your link. Post updates that are directly aimed at your target audience. Keep in mind with every update that your goal is to get clickthroughs from people seeking information about the product/services your company provides. LinkedIn can also be used to find prospects. So there is more to it than the inbound techniques I’ve outlined above. Utilize the advanced search section of the website to identify the exact type of people you are targeting. There is a small caveat to this tactic. The bigger your personal network, the greater your chance of finding prospects. If you take the time to build out a very specific search, be sure to save it for later. Another way to prospect on LinkedIn is to join and create Groups. There is most certainly an existing group for whatever niche your company occupies. A great way to find blocks of leads is join a relevant group and maintain some level of activity within it. You also have the option of starting your own group. Once you have joined and interacted in enough existing groups, you may identify an opportunity to form your own. Youtube is a lot more important than most people think. Did you know that youtube is actually the 2nd largest search engine on the Internet? You probably thought it was going to be Yahoo or Bing. Youtube is also amazing because you can embed any of the videos from your Youtube channel on to your site itself and you can also share those videos across all of your other social media platforms. 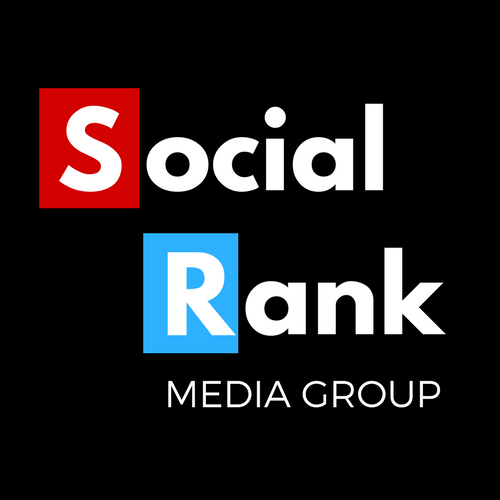 Not only is it great for for social media marketing, it’s also great for SEO. Google owns Youtube, so it’s no surprise that it carries weight in terms of their algorithm. A common misconception is that you should only have a Youtube channel if you are going to be an active vlogger. Even if you are only going to put up a few videos to utilize on your site, it’s better that any video you embed on your site come from a Youtube channel under your companies name than from someone else’s channel. From a marketing standpoint Youtube is a great way to build authority in your niche. Especially if you don’t have an actual location and your brand only exists online. Nobody does this better than Gary Vaynerchuck. It’s a way for you to put a face to your business and humanize your brand. Modcloth is another perfect example; they’ve created a virtual store that simulates the experience of walking into a vintage clothing store. If Youtube is a good fit for your business, there are many strategies you can implement. Honestly I could do an entire post on Youtube in and of itself, but I’ll touch on a few here. Just like the other platforms, consistency is key. If you aren’t rolling out consistent content, you aren’t even trying. Figure out what topics are trending within your niche and put your brands spin on them. Reach out to influencers in your community and see if you can interview them on your channel. Lion Zeal built an entire SEO community utilizing this tactic. He interviews successful people within the SEO community and asks them questions that bring real value to other people within the niche. It’s a win win for everyone involved. It boosts his channel's presence and the person being interviewed also gets some free exposure. The audience gets information that is truly hard to come by. The real lesson here is that to get a consistent following you have to post consistent content with real value. The same lesson for every platform really. Snapchat is the new kid on the block in terms of social media marketing. 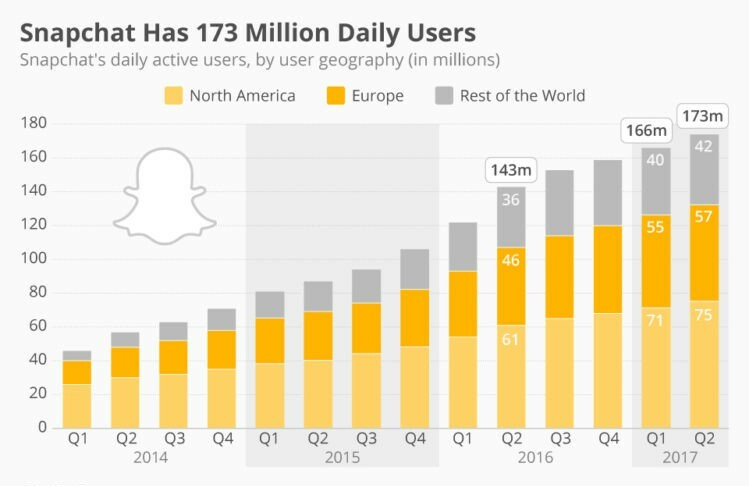 However Snapchat has more than 178 million daily users, so it can’t be ignored. Not necessarily the place I would start if you haven’t fully developed your other social media platforms. If your target audience is younger, then you should absolutely consider rounding your social media presence and start churning out regular stories on Snapchat. There is also upside in that you can save those stories and repurpose them on Instagram and Facebook. Snapchat is more raw than the other social media platforms. Consider that when posting as each post doesn’t need to be curated and edited the way your content does for the other platforms. It honestly only takes a few minutes out of your day to throw up a few posts to your story each day. Snapchat is a great way to give people a sneak peak behind the curtain of your company. Once you generate a substantial following, you can utilize Snapchat to create offers that are exclusive to those who follow your company on Snapchat. You can also create custom geo filters for as little as $5. Snapchat has also integrated ads to their platform. However if your target demographic is primarily older and a younger audience would have little or no interest in your products or services, then Snapchat may not be a good fit. More than 60% of 13-34 year olds who own smartphones use Snapchat. If that is your target demographic, you should absolutely consider adding Snaphchat to your social media marketing strategy. Pinterest is another social media platform that can’t be ignored. Especially if you are in E-commerce and your target demographic are younger women. As of Jan 2017, there are 150 million active monthly users and 70 million of those reside in the US. 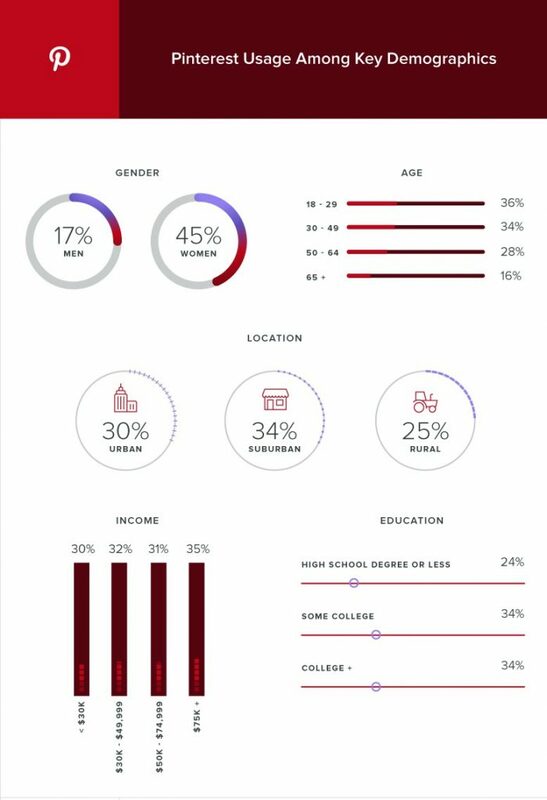 45% of women use Pinterest when compared to only 17% of men. One of the first places to start with Pinterest is making sure that all of the images on your website are “pinnable.” This way someone can pin a picture from your website without having to navigate away from your site. Pinterest’s main function for it’s users is to enable them to save images that they find valuable for later use. One of the first things brides to be do is create a pinterest board full of wedding imagery. So if your target demographic includes young women in a significant capacity, then I would absolutely create a pinterest account for your business. Start creating pins for your product or service. Join as many groups as you can as that is a great way to circulate your pins to the masses. Pinterest also started implementing the use of hashtags recently, so be sure to utilize relevant hashtags for all of your pins. Social Media Marketing can be very intimidating to those who are new to it. It's easy to build it up in your head and it gets overwhelming, I get it. Don't overcomplicate things. Research your target demographic. Once you've identified your ideal client, simply figure out what social media platforms they likely utilize. Go all in those social media platforms to get your content in front of your target audience. This will drive traffic to your website and increase sales over the long term. I'm not saying it will be easy. Nothing in life worth doing is easy. Social Media Marketing is no different. Of course there will be trial and error. Each platform has there intricacies. Take your time and do some research on the social media platforms you've identified as the best fit for your business. Trust me, there is plenty of material out there so you have trouble locating information. At the end of the day you can always outsource it to an expert. I may know a guy if you're interested.